Russia has restored contact with a new military satellite one day after a launch malfunction placed it in an unexpected orbit, the satellite's manufacture says. 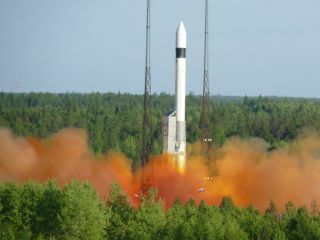 The satellite, called Geo-IK 2, launched into orbit Tuesday (Feb. 1) from Russia's northern Plesetsk cosmodrome on a mission to build three-dimensional maps of Earth for use by the Russian military. But a malfunction with the satellite's Rockot booster – a three-stage rocket derived from Russia's SS-19 intercontinental ballistic missile – left the satellite in the wrong orbit, according to Russian news reports. On Wednesday (Feb. 2), satellite operators managed to restore contact with the satellite. The satellite was reportedly designed to fly in a circular orbit about 600 miles (1,000 km) above the Earth and at an inclination – or tilt – of about 90 degrees with respect to the equator. Russian Space Forces Commander Lt. Gen. Oleg Ostapenko told Russia's Itar-Tass news service that the satellite's orbit was confirmed to be different than its intended flight path. In the Proton rocket launch failure, which occurred Dec. 5, the rocket's Block DM-3 upper stage was accidentally loaded with too much fuel. The basic miscalculation sent the Proton rocket off course. The new Glonass-M navigation satellites onboard that rocket crashed into the Pacific Ocean north of Hawaii. The Federal Space Agency and Space Forces have established a commission to investigate the latest satellite launch failure, Russian space officials said.